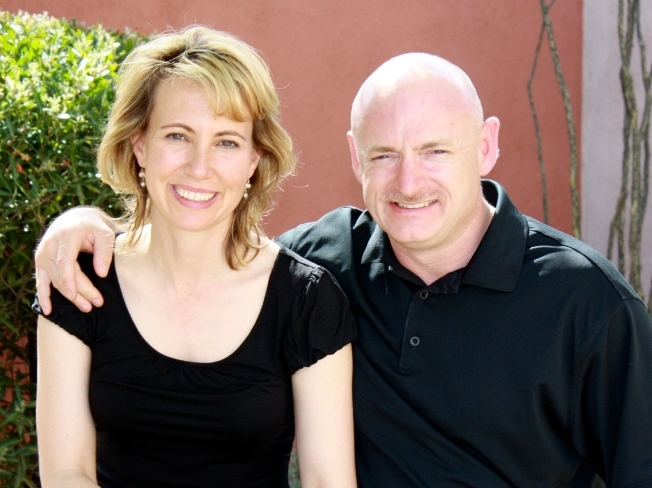 In this undated file photo provided by the office of Rep. Gabrielle Giffords, Giffords, left, is shown with her husband, NASA astronaut Mark Kelly. The astronaut husband of wounded Rep. Gabrielle Giffords will head to space in April, a stunning decision coming almost one month to the day that his wife was shot through the head. The congresswoman not only survived, by all accounts she is making good progress in rehab in Houston, where husband Mark Kelly will resume training Monday for shuttle Endeavour's final voyage. One doctor has described her recovery as "lightning speed." Kelly took a leave from training after his wife was gunned down outside a Tucson, Ariz., supermarket as she met with constituents on Jan. 8. Six people were killed and 13 were injured in the rampage; a 22-year-old suspect is in custody. He has just over two months before liftoff, targeted for April 19. There's considerable training between now and then for the mission, almost certainly with long hours and few days off for the crew. The six astronauts will go into quarantine a week before the launch, with limited access to family members. Kelly's identical twin, Scott, currently commander of the International Space Station, hinted in an interview earlier this week that his brother would choose to fly. Kelly has flown three times aboard space shuttles; April's trip to the International Space Station will be his fourth. He will lead a veteran, all-male, American-Italian crew. "My brother certainly is very good at that," he told The Associated Press. "I am absolutely 100 percent confident that he will have no problem fulfilling his responsibilities the same way as if this incident would have never occurred." Scott Kelly will be back on Earth by the time his brother flies. He's due to land in a Russian Soyuz capsule in mid-March, closing out a 5½-month mission.